Throwing Footwork for the Catcher's throw to Third Base on a steal attempt, although not encountered as frequently as the throw to second base, is every bit as hard to master, and is affected by more variables, which makes teaching exact throwing and footwork mechanics, somewhat difficult. 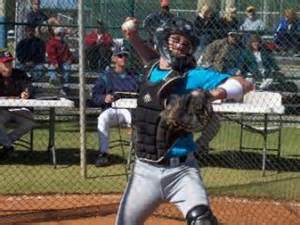 Strength of the catcher’s arm, height of batter, height of catcher, location of pitch, middle of the plate to inside or middle to outside, are but a few of the variables the catcher must deal with and overcome within milliseconds. It goes without saying a Left Handed hitter poses no problem as far as interfering or obstructing the catcher’s throw to third base, which is why runners won’t attempt to steal, only a Right Handed hitter, which is what we’ll concentrate on. 1. **Never attempt to throw Over a batter. A. You run the risk of hitting the batter with the baseball. B. You run the risk of striking your throwing hand on the batter’s helmet or bat, which could result in severe injury to the throwing hand. C. Even if you’re able to throw over the batter, the ball is initially hidden from the third baseman‘s view, which could result in him not being able to pick up the ball in time to catch it, thus a throw into left field and a run scoring. Step Behind The Batter to make your throw. Step In Front of the Batter to make your throw. 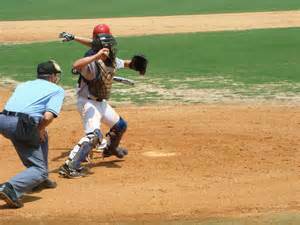 With a runner on second base and the strong possibility that he will attempt to steal third base, it’s wise for the Catcher to cheat a bit on where he normally sets up behind the plate, by moving back in the catcher’s box one step. This will give him an advantage of being able to quickly step behind the batter, acquiring an open throwing lane to third base. You must be careful to take no more than one step, because if you’re too deep in the box, you’ll have difficulty catching an outside pitch and being able to move far enough in front of the hitter to acquire a clear throwing lane. Practice is the only way to acquire the feel of where you want, if you want, to set up in order to cheat a bit in a situation like this. ***It should be noted: Don’t let the umpire stop you from moving backwards. Sometimes an umpire will get comfortable in a certain spot and mistakenly thinks he’s entitled to that area. He Is Not. Move him back. There are basically 2 versions of throwing behind the batter, which version to use will be strongly dictated by the strength and accuracy of the catcher’s arm. You begin your movement the split second you receive the pitched ball by quickly moving to your left, moving behind the batter. Depending on leg strength and pitch location to some extent, either shuffle your feet when moving, or perform a quick hop, clearing the batter. Your throwing position is identical to throwing to second base, left shoulder pointed towards your target, wide open at the shoulders, throwing arm cocked back, quickly release the ball, bringing it close passed your right ear. Try to use a four seam grip to keep the ball from tailing away, do not try to sidearm the ball thinking you’re getting rid of the ball quicker, as it will sail and not have the velocity of a ¾ arm motion. When moving out of the catcher’s box, your momentum should be towards third base, Do Not have your momentum going towards the dugout, because it’ll make your throw inaccurate and velocity will suffer, as it’s similar to throwing across your body. Version Two: This option is totally dependent on the catcher’s arm strength. In this example the catcher never raises to his feet to throw, but rather throws from the squat position. By Cheating the catcher has established himself a clear throwing lane behind the batter, he leads with his left foot towards third base and throws from his knees, falling forward. A pitch in the middle of the plate to the outside portion will force you to move and throw in Front of the batter. In order to accomplish this maneuver, as you catch the pitch, pop up from your squat position, step towards second base with your right leg, while bringing your left arm in line with third base and make the throw. Baseball players are at times, defined by their position, such as a pitcher’s fastball, a right fielder’s arm strength or a catcher’s throw to second base. We know there’s a lot more to catching than the throw to second, but it is one of the skill elements scouts do seriously consider when analyzing a catcher. 1. Never take more than 1 step to clear the batter, any more will require too much time and throwing the runner out will be highly unlikely. 2. Use the third base line as a visual guide to follow when throwing to third base. Always throw Through the Target, Not To the target, as the ideal throw should be knee high on the inside portion of third base. 3. Do not worry about what the pitch is called, strike or ball. Your job has changed to throwing a runner out, don’t wait to frame the ball before moving and throwing. 4. There’s no need to remove the mask, chances are it’ll come off your head from the forward throwing momentum. Personal Input: There is much more information available about how to throw to second base than to third base, but don’t let that fool you as it’s not as important to learn. The reason you seldom see runners attempt to steal third at the professional level is because the catcher has mastered the footwork involved in making this throw, making a successful steal of third base quite difficult. At a high skill level it is expected for the catcher to know how to make this throw, therefore scouts normally only look for ways to improve techniques for throwing to second base. Not knowing the footwork for this throw will create doubt in the scouts’ mind about other assumed skills you are suppose to have, but may not. You’re already under a microscope … don’t hinder yourself any more than necessary.